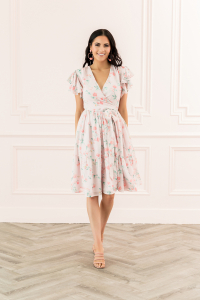 Fluttery short sleeves and a flowy tiered skirt bring soft dimension to a faux-wrap dress cut from whisper-light georgette. 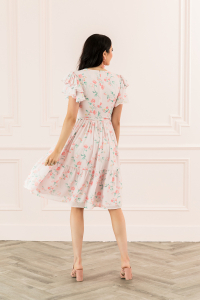 This timelessly romantic look is part of a collection of dresses and other apparel designed for making memories. Katelin is wearing a size large. This is another dress from the collection that I love for fancy daytime events. I would style with a pair of white mules or white sandals and a matching clutch!